Paul Levitz and Brendan McCarthy bring Dr. 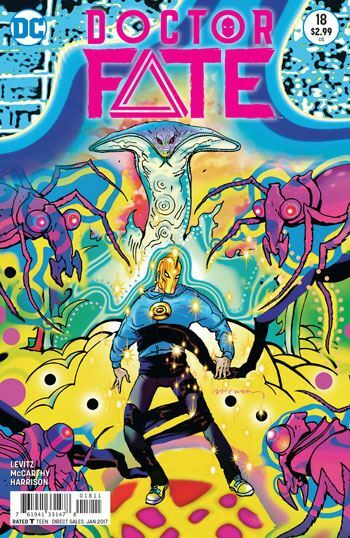 Fate to a visually stunning finale in issue 18. I am sad to see the book end, but at least it went out on a high note, and the run was strong from start to finish. The finale is actually a fairly simple affair, in terms of plot. Dr. Fate has his big meeting with Thoth, who sums up much of what Khalid has learned and experienced throughout the series. The story took him from an eager young med student with no real connection or appreciation of his past or his culture, and followed his development and growth. I think it is a real shame that such a well produced series with a Muslim American protagonist is being cancelled, when arguably it is exactly the kind of thing that needs to be being released in the United States these days. I hope we see Khalid again, and that racial and religious diversity continue to be promoted by DC Comics. Now that I have done the responsible part of the review, and banged my political drum, I will go on to critically analyze Brendan McCarthy’s art. Oh wow. Wow after wow after wow. McCarthy gets to go psychedelic and cosmic, and it’s all so lush to look at. Every single page in this issue could just pull you in to its dreamworld. I hope the collected edition of this book breathes some new life into the series, gives it a new audience. The book definitely deserves it.